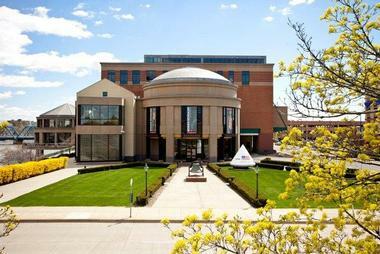 The Grand Rapids Public Museum in Grand Rapids, Michigan now boasts a revamped planetarium, in addition to ever-changing exhibits and more than 250,000 artifacts in its collections, making it the second largest museum in the state of Michigan based on collection size. There are 73 distinct collections, categorized under the following titles: History Collections, Science Collections, and Culture Collections. The Collections span dozens of categories, from advertising, building fragments, to clothing, decorative arts, furniture, photography, posters, uniforms, and weapons. While only a small percentage of the Museum’s holdings are on exhibit at any given time, the museum provides virtual access for a more complete look at the scope and depth of the Collections. 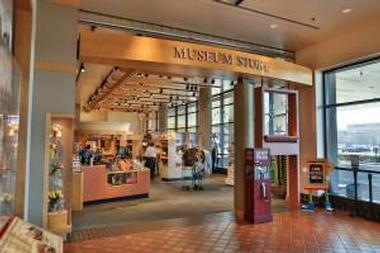 Be Curious exhibits encourage visitors to become familiar with the Grand Rapids Public Museum’s collections. Engaged in collecting for nearly 160 years, the museum considers itself the community’s institute of collective memory – where people, their stories and things are gathered together and meaning is shared. Now open, the Egypt: Be Curious exhibition showcases the Museum’s own collection of ancient Egyptian artifacts. This exhibit reveals certain artifacts, featuring Nakhte-Bastet-Iru, a mummy. See the reconstructed face and skull of Nakhte-Bastet-Iru’s that give visitors a sense of what she once looked like – and how fascinating this truly is. This exhibit dissects the elaborate funerary practices of the ancient Egyptians by drawing attention to funerary masks, jewelry, and statuettes. Observers then discover how these artifacts were handled in funeral processes, worship, mummification, and celebrations. Visitors can see hundreds of artifacts representing Native American clothing, tools, weapons, and decorative arts. Featured are videos with Anishinabe professionals, artists, elders, and parents. Visitors are treated to West Michigan’s natural environments. These are exhibits that features the natural settings for mounted animals and plants. Dioramas with images, sound, light, and activities exist so children can learn about Lake Michigan’s fish, what life can be found in a microscopic drop of water, and other ecosystems, plus the impact of humans on these environments. Inside the Kent Scientific Institute room is a re-creation of the museum’s exhibit hall prior to 1900. What’s New at the Radically Updated Roger B. Chaffee Planetarium? Having spent more than $1 million dollars to renovate the Roger B. Chaffee Planetarium, the facility now offers all guests the most comfortable seats in the house from which to observe the galaxy, and each new show takes advantage of Digistar projection technology and new sound technologies for an incomparable user experience. Just inside the museum, the planetarium is named for the Grand Rapids native astronaut who died in the fire in 1967 on the Apollo 1 spacecraft. NEW SHOW – STARLIGHT SAFARI: This program is a new adventure for planetarium goers, whereby they test their knowledge of night-sky animal constellations via a live presenter. UNDER STARLIT SKIES:Learn how to explore tonight’s sky and observe constellations from your own backyard. Expose yourself to the far-flung reaches of the solar system to see incredible planets. BACK TO THE MOON FOR GOOD:This is a great opportunity to become intimate with the race to return to the moon 40 years after the historic Apollo missions. Learn how a new era of lunar exploration is being privately funded. What a great chance to understand more about the moon’s resources and what humanity’s future on the planet might be. DARK SIDE: THE LIGHT SHOW:This is an original planetarium production with all the stops pulled out. Pink Floyd’s album is experienced in new and unique ways that should not be missed. THE LITTLE STAR THAT COULD:Explore the solar system with the Little Star. BREAKING NEWS FROM OUTER SPACE: This is a must-see show for those interested in astronomy breakthroughs. It is being offered on the first Tuesday of every month at 7 p.m. Each month, the event will examine the previous month’s outrageous astronomical discoveries. Presenters at the planetarium will act as the visitors’ guide to the ever-changing world of leading-edge science – and there will be time for your questions. This exhibit is built according to our planet’s eco-zones, bringing the incomparable adventures of National Geographic to life. Visitors thus have the rare opportunity to learn about the people and their projects, which take us – collectively – into remote and dangerous areas of the globe, help protect our planet’s biodiversity and unearth new scientific discoveries. Visitors can get close enough to this exhibit so they can explore an arctic cabin and test their abilities to survive in a world covered in ice. Plunge into the ocean in a 3-D submersible to explore life at different depths, going so far as to see a great white shark. Visitors will be able to recognize Amazonian insects at the same time they learn about the advantages of biodiversity. Visitors will experience the renown Himalayan air and take flight in a hot air balloon over the Savanna to become a little more familiar with mammals. For those inclined to icy adventures, here’s the chance to experience life on ice in Earth’s extreme Polar Regions. Beset by harsh winds and covered with icicles, see how this Arctic cabin invites hands-on discovery about survival in the Polar Regions. Test yourself by assembling the right mix of carbohydrates and protein in “What’s for Dinner?” See a polar bear march, and glance through a famous photographer’s notebook to uncover his survival strategies. Test how well various gloves protect your hands from the unforgiveable chill of an ice plate. Move on to the ocean’s eco-zone, where visitors will descend into the deep in a 3-D submersible. Get to know life at different depths through National Geographic videos that take you to places you’ve never been. See a spectacular sculpture of a great white shark and learn more about this fascinating creature. “tour” about life in this diverse realm. Learn about the ecosystem, which is largely responsible for our fresh air, and may indeed hold the key to life-saving remedies, as it safeguards our planet’s biodiversity. See what’s way underneath the surface as visitors descend closer to the Earth’s core and reach unprecedented new heights on its highest peaks. In this exhibit, you’ll meet two explorers – one who travels underground; and the other who is challenged by the highest heights. In this aspect of the exhibit, visitors will soar in a hot air balloon ride to witness endangered mammals on the move. Guests will experience the sensation of flying over a savanna where herds of wild animals still roam and meet the next generation of explorers who have devoted themselves to documenting the lives of endangered mammals of the savanna. Enjoy a close encounter with eight animal robots that draw your attention to the characteristics that size up the lives of these marvelous creatures. The animated robots are larger than life and feature a rhinoceros, a chameleon, a giant squid and a platypus, plus an ordinary house fly – except that it has a wingspan of 10-feet – a grasshopper, a bat and a giraffe. The head and neck of the giraffe extend nine feet. 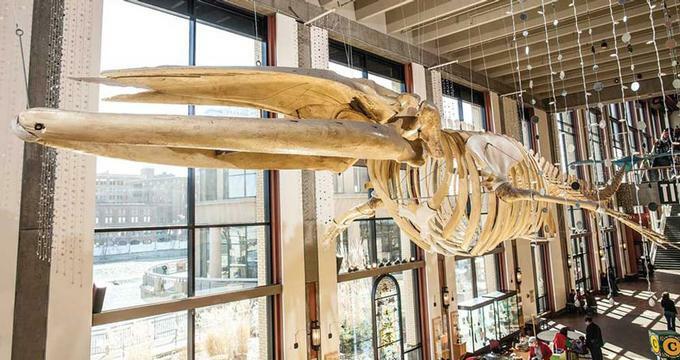 Though oversized, the machinery in the museum’s animals mimics the body parts of their real-life counterparts. In other words, animation imitates the behaviors of real animals. The artificial chameleon is observed as it prepares to lash out its tongue at an insect. When visitors see the platypus, they will observe front legs doing the breaststroke, while its tail moves up and down. The robot giant squid grips a fish, while its mouth prepares to digest its prey like a spinning food grinder. Activities that guests can get their hands on feature “Swat the Fly,” which test a visitor’s reaction time, and “Sticky Feet,” when guests experience being a fly on the wall. Using the “Tongue Gun” shows how a real chameleon uses its long, stick tongue to nail a meal. Back to: Best Things to Do in Grand Rapids, Michigan.